The College of Architecture and Design continues to upgrade and expand its lab, studio and fabrication amenities to turn out creative, prepared and relevant students upon completion of degree programs. In 2008, the School of Art + Design joined the New Jersey School of Architecture (NJSOA) to form the College of Architecture and Design (CoAD) at NJIT, making the top polytechnic university the first school in New Jersey to house interior design, industrial design, digital design and architecture under one roof. Encompassing the state-regulated professions of architecture and interior design, as well as the unlicensed industrial and digital design professions, NJIT is also the only comprehensive research university in the region to have Council for Interior Design, National Architectural Accrediting Board and National Association of Schools of Art and Design accreditations. "NJIT is very cognizant of the important role its programs within the College of Architecture and Design play in cementing our place as one of the nation's top polytechnic universities," says NJIT President Joel S. Bloom. "Architecture, digital design, industrial design and interior design are imbued with the science and technology disciplines. All of these disciplines are preparing the workforce of the future, driving economic growth and significantly improving the quality of life. Our design programs are highly regarded for the creative and innovative professionals it graduates." In 1985, NJSOA’s Imaging Laboratory became the first known academic architectural studio in the country to use computer 3D modeling as the primary vehicle for design. Additionally, the School of Art + Design was the first school to organize and submit its interior design program digitally for accreditation. Over the years, as architecture and design fields continue to innovate, CoAD continues to upgrade and expand its lab, studio and fabrication amenities to turn out creative, prepared and relevant students upon completion of degree programs. Here’s a glimpse of the new Motion Capture Studio, 3D Print Lab and Digital Fabrication Lab in Weston Hall. The motion capture lab is managed and located within the digital design program, but is used as a resource for students and faculty. ​The room is outfitted with 12 cameras, two computers and a large screen mounted to the wall. Three Art + Design classes currently use the studio: Human Factors/Ergonomics, Video and Animation and Acting Fundamentals for Animators. In 2016, CoAD added two new 5’ x 5’ computer numerical control machines to the Digital Fabrication Lab, as well as a reconditioned 4’x 8’ machine. This 60kg ABB industrial robotic arm is the centerpiece of the Digital Fabrication Lab. The arm is mounted on a 16-foot track, which allows the fabrication of building components up to 20' x 10' large. The robotic arm will expand the possibilities of teaching cutting-edge technologies used in design, architecture and the building industry. The robotic arm will also support research in automated fabrication, assembly on construction sites and manufacturing processes of prefabricated building components conducted by CoAD professors. 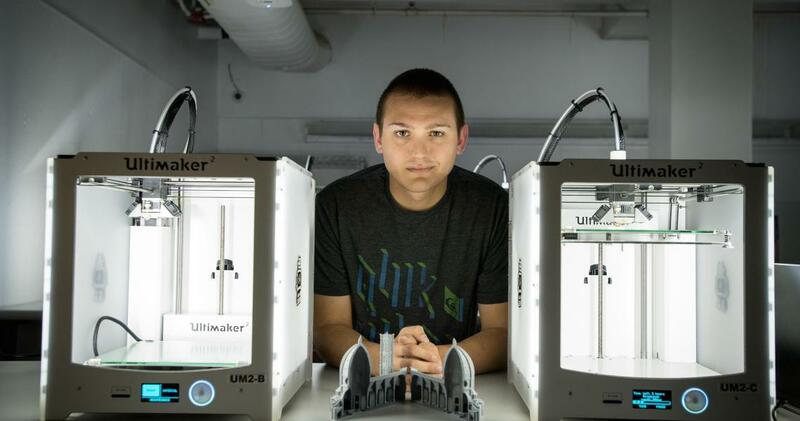 The 3D Print Lab is supplied with Ultimaker 3D printers, which allow students and faculty to produce physical models and rapid prototypes. Students fabricate detailed objects and sculptures. These 3D-printed sandals were created by fourth-year students in the School of Art + Design. This space contains roughly five architecture design studios. NJIT offers about 45 studio spaces in the Weston-Campbell-Colton building complex on campus.